Oil on cardboard, 22 x 18 cm. This sketch depicts two small Italian boys seen from the side and in profile. The broad-rimmed hats, black leather boots and brown shirts suggest that the boys Ernst Meyer sketched in this work are sheep herders, most likely from the Roman Campagna. The broad brush strokes, which outline the various elements while still leaving much unrevealed, indicate that the sketch was a quick effort. 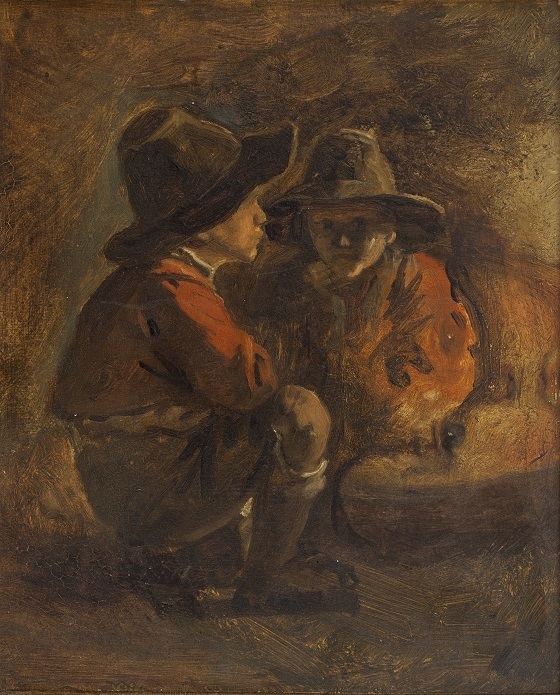 In this work, the artist appears to have concerned himself with how the diffuse glow from a flame creates a dynamic and ever-changing shadow effect across the shepherd boys’ clothes and faces. In contrast to the artist’s other light and bright watercolour sketches, he has used dark oil colours in this one to highlight the intense effect of the light and the dark mood.